Chinese Pistache (Pistacia chinensis). This is an ornamental deciduous tree with bright green leaves that turn red in the fall. The female plant produces clusters of pepper seeds. It grows up to 40′ high and 30′ wide. The most interesting aspect of this tree it that it turns a brilliant redish/orange in fall. 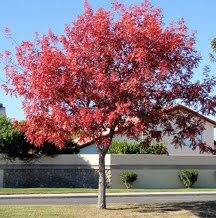 Ths is the only desert tree whose leaves turn this shade of red. This tree is hardy to below 20 degrees and is heat and drought tolerant, requires little maintenance, and is resistant to oak root fungus. Plant this tree in well draining soil, water deeply and infrequently.